The A2 Milk Company and Lion Diary and Drinks have reached a settlement regarding a dispute over the use of A2 protein claims. The two companies have publicly announced they have agreed not to proceed with legal proceedings but say terms of the settlement are confidential. In June 2016, The A2 Milk Company said it planned to sue Lion for using the statement “naturally contains A2protein” on its milk. 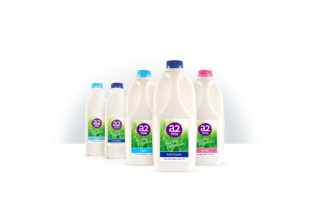 The A2 Milk Company markets its milk and dairy products based on the fact it only contains the A2 milk protein, which it says is “less likely to cause digestive discomfort”. All milk sold in Australia, excluding A2 milk, contains both the A1 and A2 protein. Lion, which is owned by Japanese beverage company, Kirin, stated on some of its PURA and Dairy Farmers milk that it “Naturally contains A2 protein”. In a statement issued 7 December 2017, The A2 Milk Company said it was please to advise a settlement had been reached in respect to the legal dispute with Lion Dairy and Drink. Currently, PURA and Dairy Farmers milk make the claim “naturally contains A2 Protein” with an asterisked disclaimer stating that the milk naturally contains A2 milk, as well as A1 proteins. “Of those proteins our tests to date confirm that 50-70% is A2” the disclaimer further states. A Lion Dairy and Drink spokesperson confirmed both parties have mutually agreed not to proceed with their cases against each other.